What I can share with you are some pieces that EVOLVED from that original session that I am JUST as excited about. I worked on these yesterday ~ after an overwhelming itch to create didn't subside, I decided to clear my calendar and spend most of the day playing in the studio. I'm so glad I did! I've employed several techniques here. The most obvious is the overmarble ~ an Italian vein ~ which gives them their final look. The first marbled layer is the group of bull's eyes. In that original layer, I created white space around the bull's eyes using a dispersant. As you can see in the piece on the far right, I used dispersant again to squish the bull's eyes closer together (something I didn't do with the other two). Then I decided to do each Italian-vein overmarble in one of the colors from the bull's eyes ~ from left to right: red oxide, cobalt turquoise, and yellow oxide. I have a couple more variations that incorporate the white-space, bull's-eye background that I will post tomorrow. Stay tuned! And if you too are feeling the need to create ~ GO DO IT!! Don't ignore the call. Amazing things will happen ~ mainly, happiness will ensue! And get updates sent to your inbox! Thank you for subscribing to my blog! 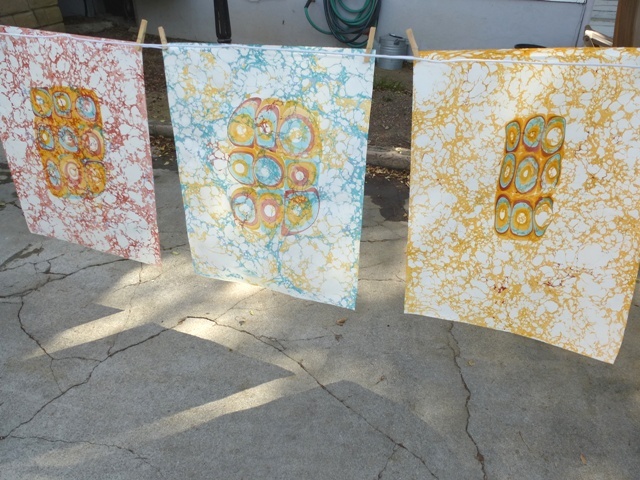 I look forward to sharing my marbling journey with you!